Vintage fig plant drawing from 1750. It is the work of the famous German botanical artist Georg Dionys Ehret (1708-1770). He was the most influential botanical artists of all time. Originally a helper in his father’s gardening business, Ehret would start his art career by painting the flowers in the Margrave Karl III Wilhelm’s Baden estate. 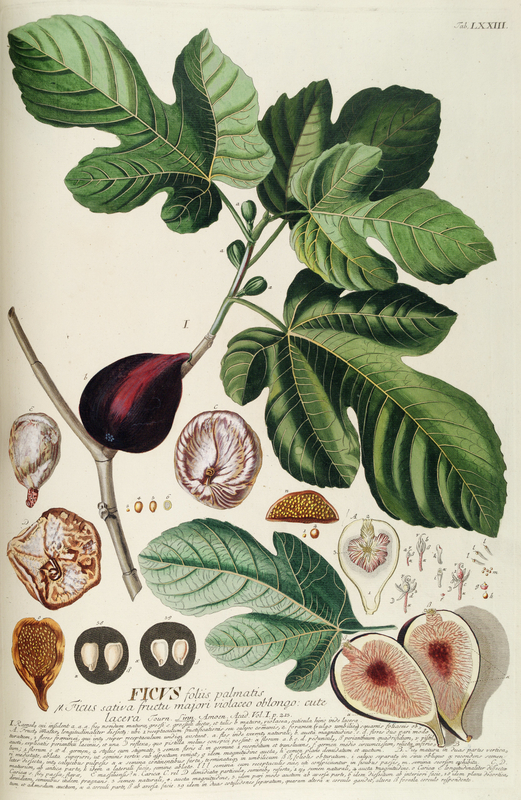 With an inscription that appears to be in Latin, this botanical print shows the complete life-cycle of the fig plant. I wish the scan was a little better so it could be used as a botanical print but I’m sure it could prove helpful to someone studying the biology of figs or looking for pretty leaves or a fig drawing for their own creative endeavors. The original version of this fig plant drawing is too large to display all of the time. If you want to access it, simply click on the image shown above.